The Alternative Information & Development Centre’s (AIDC) latest research – One Million Climate Jobs – Moving South Africa forward on a low-carbon, wage-led and sustainable path – makes clear that there are potentially hundreds of thousands of jobs in championing low carbon development, as a complimentary strategy to a wage-led development path. The global economy is facing numerous structural challenges. With the looming fourth economic revolution characterised by even more technological development and mechanisation, the future of productive labour is bleak. Most unskilled and semi-skilled workers are likely to lose their jobs. Even some skilled workers are not spared from this emerging catastrophe, as numerous job categories – such as brick-layers – are increasingly becoming redundant. This points to the urgent need for planning, for conscious investment in job-rich, growth opportunities that enable economies to build productive capacity in labour intensive sectors. One way of achieving this is to strengthen wage led growth, which, in turn, stimulates aggregate demand through enlarged household incomes. Without a dramatic increase in the wages of mine workers, farm workers and all employed people in our country, we will never be able to deal with South Africa’s most urgent problems: inequality, mass unemployment and poverty. Since unemployment is the greatest determinant of poverty and income inequality, we can expect these, too, to worsen. Already, in 2015, 30.4-million people, that is, 55.5% of the population live on less than R441 per month, or less than R15 per day. The fact that 10% of South Africa’s population earn around 60% of all income, points to South Africa’s widening inequality. Even more alarming is that the richest 10% of the population own at least 90–95% of all assets. With these terrible statistics in mind, it becomes redundant to repeat what we have been saying as a trade union for a long time, namely, SA urgently requires the redistribution of wealth. When the millions of working people in our country can afford what the few take for granted – a television set, a washing machine, dining room table, etc – we create the conditions for developing the economies of scale that can sustain local industries from the intense competition coming from a globalised economy. In this way, we will be able to make in-roads into the almost 10 million people who are out of work, out of income and out of dignity. The importance of the climate jobs work the Alternative Information & Development Centre (AIDC) has been leading is that it identifies where the jobs can be created. 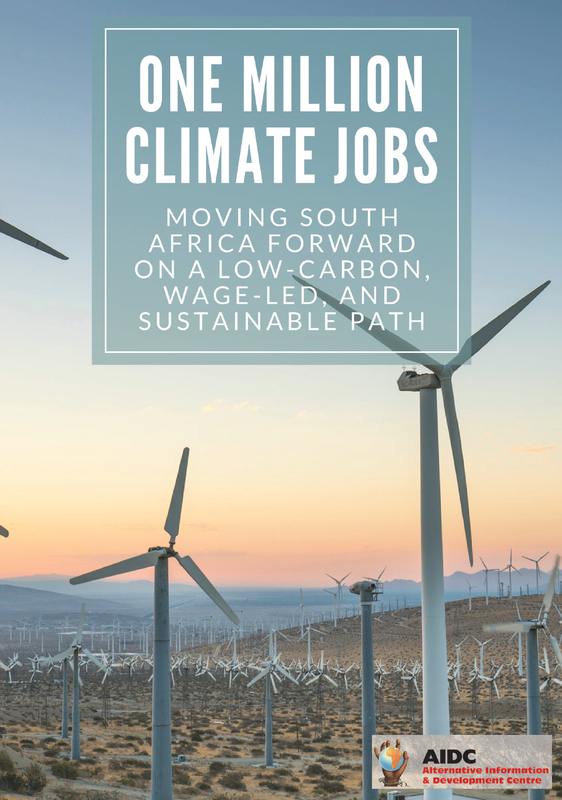 As AIDC’s latest research – One Million Climate Jobs – Moving South Africa forward on a low-carbon, wage-led and sustainable path – makes clear, there are potentially hundreds of thousands of jobs in championing low carbon development, as the complimentary strategy to a wage-led development path. The AIDC’s solidarity with AMCU (the Association of Mineworkers and Construction Union) is greatly appreciated. It is a solidarity based on a shared approach and conviction of the urgent need to confront the numerous challenges facing our economy, the people whose needs the economy is supposed to meet and the sustainability of human life on a planet heating to unsustainable levels. However, AMCU is a trade union representing mine workers and construction workers. These workers are embedded in the very industrial processes that are at the centre of contributing to global warming and other environmental problems. It is inescapable that, if we are going to move decisively to a low carbon less polluting economy, it is going to be at the cost of coal mining, coal fired energy plants, coal to liquid gas, etc. Unless jobs are offered to our members in clean industries, they would never voluntarily agree to the shutting down of mining and energy industries. It would be like asking them to commit suicide. We are, of course, aware that doing nothing about global warming also represents a long road to destruction. However, as you must be aware, many of our members would prefer to take the long road, based on the illusion that we can postpone the inevitable. Yet AMCU cannot be expected to bear the costs of dealing with the climate crisis. This is why we need a just transition to a wage-led, low carbon economy; a negotiated transition that is the outcome of careful planning by government, business and labour; a transition that guarantees affected workers a decent, alternative job and wage. It is only on this basis that you can reasonably expect any worker to be won to the fight against global warming and of doing something to halt the climate crisis. Since many of our members have a close relationship to the land, many have first-hand experience of the impact of climate change. The recent drought we have experienced in the northern parts of the country has exposed many workers to the reality of climate change. We must use this as a basis to deepen the consciousness of workers on the nature and scale of the climate crisis we are facing and will face in even more extreme forms in the future. Regrettably, there are still no discussions between government and labour on mitigating the climate crisis and negotiating a just transition to a sustainable climate and less unequal society. Indeed, the current actions of government – or should I say non-action of government with respect to the impact of the economic crisis – where thousands of mine workers are losing their jobs, sets a very bad precedent for managing such a just transition. The government is not even mitigating the economic crisis, as far as workers are concerned. Many companies are embarking on retrenchment processes and additional thousands of workers face job losses. Hence, as AMCU, we need to link with other trade unions and social movements to force government to deal with the current economic and climate crises. In the first instance, we need to fight for a moratorium on retrenchments. To this end, we have applied to NEDLAC for a Section 77 notice to undertake mass action. We await the certificate for protected protest action in order to elevate this issue and expose the threats that it poses for our economy. 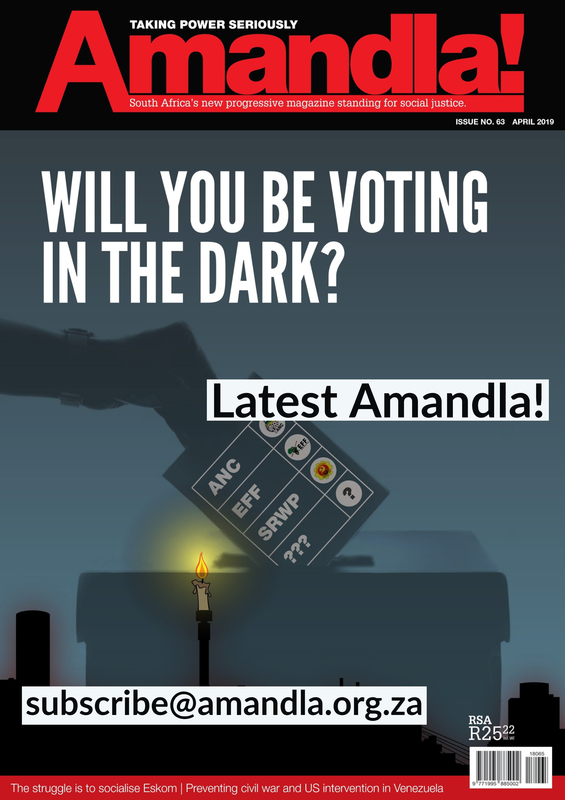 Recently, the corrupt bosses of Eskom tried to manipulate the trade unions to support nuclear and coal fired energy by announcing the closure of five coal fired power plants. This was a cynical manoeuvre to use the fear of job losses to keep alive plans for the expansion of coal and nuclear energy, as opportunities for further looting. The renewable energy industry was blamed for the resulting job losses in coal fired energy. Heavy propaganda is being directed at trade unions to get them to endorse nuclear energy, in the belief that this will create jobs. We will not allow ourselves to be manipulated into supporting the looting ambitions of the predatory elite. We believe South Africa has great potential to build a significant renewable energy industry, as indicated in AIDC’s Million Climate Jobs research. We must demand that government invests in creating jobs in areas that also meet the immediate needs of our people. One such need is housing. The Reconstruction and Development Programme proposed that government invests 5% of GDP in a massive housing programme. If government were to build houses instead of outsourcing them to profiteers (so-called developers) we could strengthen the resilience of working people in dealing with the deepening climate crisis. How much better if those houses are built in an energy efficient, environmental and climate conscious way. Not only would they be built with solar water geysers but could have embedded solar panels providing most of the electricity needs of the household and then some. This could lay the basis for energy co-operatives that could sell surplus energy to local government. As AIDC has indicated, there are many things that can and should be done to deal with both the economic and climate crises. In this regard, I would be amiss if I did not mention the importance of forcing mining companies to invest in rehabilitating the environmental damage they have created and left everyone else to fix. 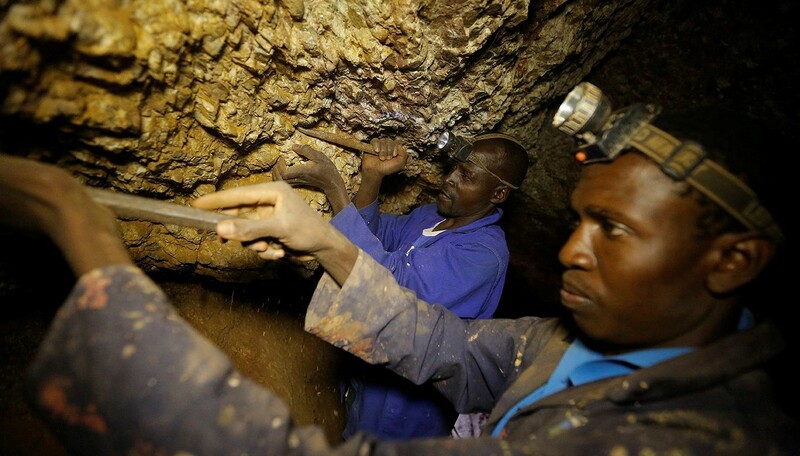 This long-neglected rehabilitation could create many decent jobs and help absorb miners currently being thrown out of work. Rehabilitation would restore the quality of our soil, water and air, which by themselves are important interventions to address the climate crisis. Comrades, we are facing a deepening political crisis. Unless we address this and get rid of the gangsters who run our country, we will not be able to do anything to address the climate crisis. As AMCU, we are prepared to collaborate with all progressive forces in undertaking these urgent life and death tasks together. We look forward to further collaboration with AIDC and all involved in the Million Climate Jobs Campaign. Joseph Mathunjwa is the President of the Association of Mineworkers and Construction Union (AMCU). He was expelled from the National Union of Mineworkers in 1999. Three thousand workers, at the Douglas Colliery where he worked, went on a 10-day underground strike in solidarity with him. AMCU was formed, shortly afterwards, when these workers resigned from NUM.